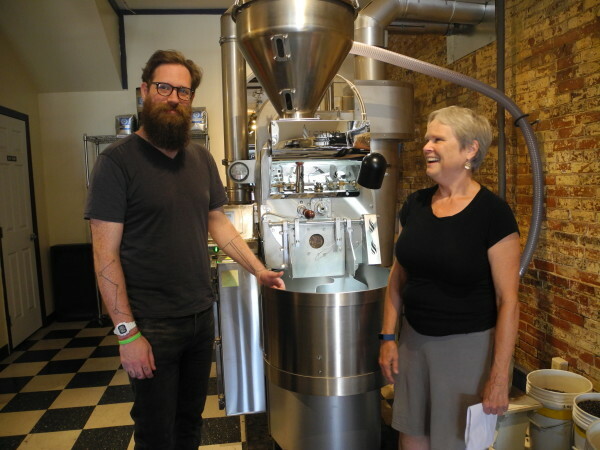 Susanne Ward, owner of Rock City Coffee Roasters and Rock City Cafe, is looking forward to transitioning the company’s business model to that of an employee-owned cooperative. Posted Nov. 09, 2016, at 11:18 a.m.
Maine’s economy faces “significant challenges,” to use a common euphemism. Newspapers across the state lament the decline of manufacturing, various disconnects between needed and available educational opportunities and the continued mixed bag that tourism offers as an engine of growth. Outmigration, stagnant wages and a “graying” population are the norm in many communities. We hear of economic fixes, but they don’t seem to do much. Whether attracting more manufacturing via tax breaks, trying to grow our own innovation economy, attempting to create a better system of higher education or nurturing home-grown business, there are flickers of hope here and there but a lack of critical momentum. There are no silver bullets out there, but in a new report produced by the Cooperative Development Institute, a New England-based business assistance organization, we argue that cooperatives and employee-owned businesses can be the change the Maine economy really needs. We show how this business model could grow Maine’s economy, reverse demographic decline and foster widely shared prosperity. We envision a Maine economy in 2030 that is a much more diversified, with the linchpins of this emerging economy being businesses owned by groups of consumers, workers, producers and independent businesses. In this economy, traditional investor-owned firms and sole proprietorships still outnumber cooperatives, but the cooperatives are critical in providing an economic, social and demographic spark that builds widely shared prosperity in Maine. Selling to employees becomes a common business succession strategy, anchoring businesses in communities. Skilled craftspeople, software writers, artists, farmers, machine tinkerers, new Mainers and hosts of others see cooperative formation as an attractive, viable and familiar business possibility. Most importantly, we believe this prosperity would reach much deeper into the areas of Maine that have struggled the most. Returning to 2016, there are, of course, already cooperatives in Maine. Credit unions, employee-owned businesses, and electricity, food and fishing cooperatives are scattered across the state, and the report profiles many of them. But the transformative nature of an economy anchored by cooperative and employee-owned businesses remains to be realized in Maine. It is time to recognize this potential. Cooperatives can create tremendous efficiency within a business and across cooperating businesses. Employee ownership, whether as a worker cooperative or an employee stock ownership plan, in particular provides an incentive for businesses to invest in their workers and workers to invest in the business, thereby increasing productivity. The possibility of being an owner can attract key talent, and it can turn a perhaps-unenviable service job — think the classic “flipping burgers” — into a viable career track with real possibilities of financial upward mobility and the status that comes from business ownership. Cooperatives exist to meet the needs of their owners, not outside shareholders, so they are much less likely to leave a community to save a few bucks on labor costs, cheaper wood fiber, or at the whim of a distant boardroom. Cooperatives build social capital and increase community engagement, and they are directly associated with poverty reduction and positive social outcomes, particularly for economically marginalized groups. One example we can look to is Finland, a nation similar to Maine, with its peripheral and rugged geography, long winters, historical economic reliance on natural resources and agriculture and a small, sparse and homogenous population. In the early 1990s, Finland was at a crossroads, facing economic challenges similar to Maine’s. Today, it has the greatest concentration of cooperatives of any country in the world, and Finland is among the top 10 nations on every measure of economic and social progress. This is not a coincidence, and it did not happen by accident. Rather, it was the result of conscious policy choices. Maine has the potential to replicate this kind of success, but we must take steps to promote and nurture what we call a “cooperative ecosystem.” We need to set goals and priorities, legislate supportive policies, incentivize investment capital and provide education in entrepreneurship and cooperation. Our report proposes an agenda that would build a cooperative ecosystem of public, private and philanthropic institutions, policies, incentives and finance. While our proposed path is ambitious, it is achievable, and it would go a long way toward building a prosperous, equitable economy where all Mainers — young and old, new and longstanding — can fulfill their needs and aspirations. Davis Taylor, Ph.D., is a professor of economics at the College of the Atlantic in Bar Harbor. He is a member of the board of directors of the Cooperative Development Institute. Why a Cooperative Economy for Rural Maine? I see two big threats to the support of population in rural Maine. The first is more immediate: the changing nature of the U.S. economy and what it means for rural people. We know the story. It hardly takes any people/employment to do the resource extraction and agriculture that is the long-time mainstay of economic activity in rural places; this is the primary reason for the emptying out of rural places. Manufacturing jobs, some of which were located in rural Maine or its medium-sized river towns 30+ years ago, now require additional education beyond high school, and the 30-odd year gap between Maine’s manufacturing decline and the present means that, unlike places like the Carolinas (who had textile manufacturing until relatively recently; they took Maine’s jobs), Maine would have trouble attracting such high-tech manufacturing anyway. This latter trend ties in with increased clustering of manufacturing activity. Maine has a small base of high-tech service businesses, but even if this grows, it is not likely to provide sufficient jobs in the right places to keep rural Maine populated at its current (depressed) levels. The second trend is more long-term, but I think it is short-sighed to ignore. This is the environmental/ecological impacts of our contemporary economy. There are several known dimensions of this threat, and probably ones we don’t yet know. I am not a climate alarmist, and the sea level going up a foot isn’t going to devastate Maine. But think about it: warm water in the Gulf of Maine is already affecting lobster populations and their health. (Not sure I recall the specifics exactly, but the center of the Maine lobster catch has moved from Casco Bay to Stonington); if the lobster goes in the next 10 – 30 years, it’s possible that coastal tourism could take a major hit. Additionally, the Gulf of Maine is one of the fastest-warming bodies of water in the world…and it is cold waters that give us cool summers relative to the rest of the Gulf Stream-ensnared east coast of the U.S.
Apart from climate, and in a larger and more general sense, the manufacturing trends outlined above means that, if it takes fewer people to operate machinery that is more and more productive (the only way, we are told, that U.S. manufacturing can compete with China), the only way to maintain our current level of manufacturing employment is to produce exponentially more stuff. Put another way, needing smarter and smarter people to operate manufacturing machines implies that those machines are increasingly sophisticated…which means they can replace more people…which means to stay employed, workers will have to be even smarter, which will permit them to work even more efficient machines, which will replace even more people….onward, onward. I can’t believe that the logic of this is lost on smart policy-makers; it just seems that the immediate situation is so desperate for workers that the immediate response is to jump into this maelstrom with more education for workers, thus continuing the process; no one wants to look ahead to the long-term (which probably isn’t more than 20 years off). It seems we’re not going to run out of hydrocarbons anytime soon, but there may be other limitations to this growth process. I don’t see it continuing uninterrupted for another fifty years….we would be buried under 3D printed plastic crap. When it takes one person to run a huge factory, people are going to have to find something else to do (or work less, which doesn’t seem culturally permissible in the short- or medium-term). I have some sense that younger generations are awakening to the illogic of all of this, educating themselves and others about it, and trying to do something…but change is extremely difficult to make happen, because it requires a wide array of mutually-reinforcing changes to make anything stick; in many ways, significant institutional change is a massive coordination problem. The ideas above represent my concerns about the contemporary situation. I really think these are the most interesting of times, for rural places. Rural places in Maine are in a long, drawn out process of economic, social, and cultural collapse. They won’t empty out completely, but they will continue to become shells of their former selves. Ironically, the more that former resource extraction and manufacturing workers leave, the more the door is open for second homes, traditional tourism, ecotourism, (modest) creative economy activities, and similar stuff. And these activities produce service-based jobs that will need filling. Some highly specialized, idiosyncratic manufacturing will remain. Resource extraction will remain, but continue to lose jobs via technological innovation and capital intensification. –rearguard: help people get ready to be “the survivors” in hollowed-out rural places. –reversal: reverse the long-term trends through some kind of economic miracle (e.g. fracking in North Dakota…though that hasn’t actually done that much for rural North Dakota…the farming towns continue to empty out while Bismark and Fargo grow) or some kind of massive government intervention (e.g. the agricultural policies of the EU). If we are going to do something, one attribute of an ideal course of action is that it could be palliative if there is little chance of truly transforming rural economies toward a more vibrant outcome, or actually part of that positive outcome if that is possible. Actions need not be considered mutually exclusive in this regard. As noted in several places, but also in less obvious ways, these cells interact with each other. Fostering worker owned businesses will be a long, uphill battle…but I think it’s worthwhile. It meets a lot of positive criteria: it’s feasible (according to the chart above). Referring to the list further above, it can be seen as palliative, reardguard, and potentially adaptive and reversal. The chances of positive change are sufficiently large to make this option better than doing nothing. It probably needs a large dose of continuing education, but also feeds into that. Focusing on expanding enlightened capitalism is too slow and has too much chance of being unsuccessful; encouraging withdrawal will be ineffective. Focusing only on continuing education is too slow and too isolated. So, fostering worker owned businesses is the best option. A friend who works for Greenpeace recently sent me a link to a video in which author and environmental activist Annie Leonard explains why she and many others feel that “cap and trade” carbon markets are a bad way of reducing carbon in response to global climate change. The debate regarding carbon trading is particularly lively because economists are almost universally in favor of carbon trading as the most effective, least-cost means of reducing carbon emissions. The video is a great summary of what I take to be the key issues, and you can find the video here. A brief critique of the video: it starts off by poisoning the well…Goldman Sachs is involved in carbon markets, so they must be evil! Then Leonard points out particular problems of existing trading schemes (permits given away, volatile trading, bogus offsets) and concludes that therefore carbon markets don’t work. My commentary: markets are working to a significant degree in California…auctioned permits, steady trading above the price floor, pretty thorough inspections to make sure offsets aren’t bogus, etc. ); it’s definitely trickier and more expensive to implement than command, especially correctly, but the savings between trading and command might make it worthwhile. It would come down to the numbers, and nobody is talking about then. But so far, California seems to be showing that it can work. Then the video gets into the third problem, that cap and trade is a distraction, that we should go for the “big solutions.” I more or less concur that big solutions would be better…change society, get rid of carbon subsidies, decarbonize, get off of the growth merry-go-round. etc. I’d like to see all that happen. But I don’t think it will. It may sound like I would come down on the side of the cap and trade, but the video really makes a very good point. I remain highly critical of people who install CFLs in their homes and feel they’ve done their part (or a college that puts in a bit of solar panels and says “we care.”) But then one is left with the conclusion that “well, cap and trade is a distracting and ineffective exercise, BUT real change is never going to happen…so we’re basically screwed.” Which is pretty much my conclusion, at the level of the big picture. But as long as I’m ranting, let me share some additional latest thinking. This whole situation is usually framed in the context that “we” need to take significant steps “to avert climate disaster” [often with reference at this point to children or grandchildren]. I think this framing contains two, interrelated untruths: that there is a “we” and that there is a “then,” something in the future to be averted. Neither contention is true. Climate change is happening NOW, affecting people NOW, killing people NOW. The dying are largely invisible because they’re mostly poor people in poor countries, and it’s hard to say who exactly was killed by climate change, versus pollution or government idiocy or deprivation due to lack of political power, or what…but I think we can easily say that it is happening now, inter alia. And we can just as easily say that *some* people will NEVER be affected by climate change…they will build higher sea walls, better buildings, get better air conditioning, buy better medicine against climate change induced diseases, afford food despite diminished supplies, etc. Some people are hurting now, and some people will never be hurt by climate change. There is no “we” and there is no “then.” Just like always, there are people dying now because they don’t have the power and resources that others have; it’s really not that different from the age-old patterns of power and resource distribution that lead some people to lead relatively short, brutish lives while others live in comfort for a relatively long time, for whatever particular circumstance. We can ask why climate change resonates more than other local or global injustices; amongst other things, it probably has something to do with the scale and boundary-less nature of the problem. But regardless, the problem is with us now, but some people are grossly affected, while others are not, and won’t be. I believe that the “we and then” construction gives us solace in the face of our contradictory existence. The unity implied by “we” both feels good in the sense of global brother/sisterhood and hides the fact that the good people flying to a climate conference (or driving to work at their cool little college) are killing Bangladeshi farmers. And the “then” of course means we can keep doing what we’re doing, living the way we’re living, because there’s just a little bit more time before “disaster” is upon “us.” We can wait until “we” get our act together, “then” we can save the planet. I really don’t know where this assessment of “we and then” leaves us regarding cap and trade versus big political and economic changes as means to lessen carbon emissions and climate change. Neither one acknowledges the contradictions of our existence, which consists largely of recognizing that doing “the right thing” in regard to our suffering fellow humans would require we in the North uprooting our entire individual lives and collective culture in ways that really can’t be asked of us, that would destroy us emotionally and socially, if not physically. But I think I’m a little bit more suspicious of the false nobility of the comfortably impossible cause. When I think of the falseness of “we and then” in the context of my own life, the fact that people are dying right now suggests that every little bit counts, everything I can throw into the battle to make the world a better place right now is going to help, will save lives…even as I recognize that I can’t change the world, or myself, as much as I’d like. As is so often the case, one of my students has sent a very interesting link, that sparks a dialogue about economic choices our society faces. In this case, the link is to a video describing a (European) proposal for providing all (EU) citizens with a guaranteed basic income. You can see the video here. The proposal is interesting. The first concern that arises is what will happen to productivity. Will people still want to work, when their work isn’t tied to their incomes? Will a country that adopts this approach become an impoverished (at least as far as income) land of poets? And will the highly productive people who want to work, to earn more income above the basic income, be willing to share those gains with those who aren’t working or are working in low productivity jobs? It does seem that we have a tremendous amount of wealth, our societies are rich enough to provide everyone a basic income…but we GOT that rich by having lots of incentives to create wealth: those who created it got to keep it. (To varying degrees some did that on the backs of others… but a lot of it was legitimate wealth creation nonetheless). You cannot separate either the basic income proposal or my job sharing proposal from norms (New Institutional Economics, of course)….our social norms would need to change considerably. I think the norms necessary for for a shorter work week would be easier to move toward (because we already have shortened the work week a tad…just not nearly enough, given productivity gains) relative to the norms necessary to make a basic income a human right (give me something for doing “nothing”…”nothing” in quotation marks because it’s really wrong to say that poetry and parenting is “nothing”…but those norms persist). For either proposal, however, we need to keep pushing the ideas, to have them “on the shelf,” becoming normalized and ready to go when we’re ready for some change. “I teach economics, as I mentioned. At COA, off course there are plenty of students interested in sustainability, and also quite a few who are suspicious of standard economics. Ecological economics answers both situations: it’s the economics of sustainability, and is in marked contrast to standard economics in lots of ways. Once I got into teaching ecological economics, I got into sustainable food systems, which led me to farming. It turns out, additionally however, that a lot of ecological economists see cooperatives and a cooperative economy as a necessary part of some kind of “sustainable” future. So much of sustainability is somewhat hopeless/depressing (once you start looking at it systematically and intensely as ecological economics does), but cooperatives are a major bright spot, one of the few places where change can be real, effective, and possible (possible, as opposed to, for example, us stopping using carbon-based fuels anytime soon; getting rid of carbon would be *highly desirable,* but I think it will be a cold day in hell before we actually restrain ourselves in this realm, and many other, realms). Plus, my students love the idea of a cooperative economy, it really gets them excited and inspired. So I work it into a lot of my classes, have a new dedicated class (The Economics of Cooperation, Networks, and Trust), and do cooperation in real life whenever I can. I’ve been involved in co-op startup efforts in Bar Harbor and Seal Harbor (both ultimately unsuccessful), co-managed a buying club for about 4 years, and am working with another farm toward some kind of producer co-op for local foods in Knox County. Throw in 1) the desperate state of the rural Maine economy and resulting out-migration of young people, and 2) the financial constraints to doing small scale sustainable agriculture as a sole proprietor, and all off a sudden co-ops and cooperation make for a pretty important topic. I’m reading The Merchant of Prato, by Iris Origo. Written in 1957, there are no doubt more up-to-date treatments of the the Medieval European economy. But as it was written by a non-economist, it portrays the every-day life of Francesco di Marco Datini, 1335 – 1410, as well as the economic scene of the time; its economics, politics, religion, and personal life all rolled into one. As such, it’s a much better read than most economic histories, but still has plenty to tell. Production is carried out by extreme specialization, requiring inputs and intermediate products to change hands many times. In the production of cloth, wool is carded, fulled, sheared and cut multiple times, spun, woven, measured, dyed, and many, many other steps, all by different people. Some production is shared out to peasant households, such as weaving. Most of this production is organized by guilds…the guilds are the center of economic life. Merchants organize production as individual agents, but the steps they must take, the rules they must follow, the who-does-what, is all determined by guild rules. The guilds provide two main functions: establish some monopoly power, by all their rules and requirements, and create trust and reciprocity (because any bad dealings mean getting kicked out of the guild, which means going out of business); like all institutions, they seek to reduce uncertainty in what, by many measures, is a very, very uncertain time. The guilds establish voluminous sets of rules for how things are to be done, where and how things can be sold, limited points of entry and exit, and lots of penalties if the rules are broken. The economic system can thus be characterized as some kind of market feudalism. Markets are very present, but entry to them is highly restricted, and price is determined at least as much by custom (in the form of guild restrictions and numerous taxes levied by sovereigns or municipal or guild authorities) as by supply and demand. Access to economic resources such as mills is highly restricted and taxed.The feudal state controls the ultimate means of production (land and labor combining in agriculture), but merchants are acquiring massive wealth without the control of these factors of production. The economic fate of people is tied not only to weather (the biggest variable in agricultural production), but the fortunes of war, piracy, and pestilence , all as a result of the increased opportunities and perils of trade. Risk is everywhere: all travel has to happen with heavy arms and escorts (A surprising amount of transportation of goods happens overland, via mules.). Plagues can shut down a city and its trade, meaning orders for inputs do not get filled, and finished goods do not get sold, with disastrous results for merchants. Monarchs borrow money to fight wars, then default, leading to chains of bankruptcies. Wars between cities states, religious feuds, and travelling bands of mercenaries all can shut down trade. It can take upwards of 3 ½ years to go from ordering wool at the point of shearing to the sale of fine dyed cloth. Most of the finished products are destined for the rich…who pay very dear prices to cloth themselves in the finest cloth, decorate their houses with drapery, art, carved and inlaid furniture, etc. They must pay for all of this, which means value is being appropriated from somewhere: the peasants of course. Great wealth is still available from the usual feudal sources, but add to this the growing wealth of the merchant class, who also want fine clothes and goods. Basically, the merchants provide a new means for the nobility to display wealth…prior to all this trade, being nobility meant having the best local stuff, but now it means having the best stuff from the far corners of the world…a process which enriches the merchants (though plenty of merchants lose their shirts, too). So we have two wealthy classes, with all this wealth ultimately being produced by the peasantry and an army of craftspeople in between. Some of this new wealth is due to subtle improvements in the technology in production, but a lot of it probably just comes from comparative advantage…furs that are a dime a dozen in the Baltic fetch high prices in Italy. The greatest technological development is probably in the mechanisms of commerce, e.g. letters of credit, double entry accounting, etc. Already the merchant class takes no interest in the affairs of state other than as they relate to trade….everything is about trade, with religious salvation (and hence, good works, charity, etc) taking a back seat, with civic duty and virtue a very, very distant last place. Already the fate of the peasantry is tied to this global economy. Riots and insurrections occur when business conditions are poor, for example when merchants aren’t ordering enough wool to be shorn, processed, and woven. (e.g. a peasant revolt in Florence with demands that a minimum amount of cloth be ordered, to keep the peasants employed in cloth production and not starving). When Richard of England defaults on his loans, huge merchant/banking houses go bankrupt, leading to cascading chains of defaults of smaller houses, leading to starvation in the countryside. In the end, everyone gains, to some degree or another, by this trade system; those who stand to gain the most also stand to lose the most, at least in raw financial terms. Even the peasant gains, as s/he realizes that a paltry, mean existence of scratching out existance by agriculture under the thumb of the ruling feudal system can be improved upon by taking in a little wool for weaving. This can stay at a small scale and provide a small amount of additional income, but it could also perhaps eventually lead for this peasant to the formation of a new guild, and thus moving from peasant farmer to craftsperson, with a bit more comfort in life. (It’s not clear what percentage of peasants are engaged in non-agricultural side activities.) But the specialization that is involved means those involved become more dependent on others, and on events in distant lands. To gain, we must become slaves.